When you hear the name Dirt Devil you associate the name with vacuum cleaners but did you know that Dirt Devil manufacturers vacuums not for the home but for your swimming pool too? Now you can get the same great cleaning that you would from your carpet Dirt Devil for your swimming pool. 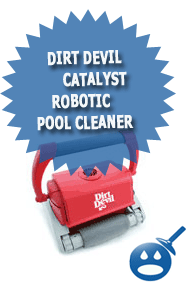 The Dirt Devil Swimming Pool Vacuums are not automatic pool cleaners but with the reputation of the Dirt Devil, you can guarantee that you will have a crystal clean swimming pool when you are done. Dirt Devil uses the most current technology when it designed these vacuum cleaners. Gone are the days when you would have to assemble your vacuum and hope the connections holds the head to the hose. Now you can clean your pool with ease. The cleaner is easy to install and easy to use. There are three top selling Dirt Devil Swimming Pool Vacuums, the Dirt Devil WhisperVac, the Dirt Devil D1000 and the Dirt Devil D2000. This Dirt Devil offers the customer the capability of vacuuming all different types of in-ground swimming pools no matter what shape, size or material the swimming pool is made from. With the Dirt Devil WhisperVac, you can install it in just minutes. The vacuum cleans fast and easy and the best part is that the vacuum is Whisper quiet. Unlike the automatic swimming pool cleaners, you will not use any electricity because the Dirt Devil WhisperVac hooks right up to your filter system. The Dirt Devil WhisperVac is customer engineered with the trademarked Unifram Cleaning technology that offers the customer a quiet vac and a vac that offers a quick cleaning pattern. With the Dirt Devil pool cleaner you will also get the benefit of a hydrodynamic design for smoother transition from the swimming pool walls to the pool floor without any additional wear and tear on the liner. The vacuum comes with a ladder guard to help with a smooth and uninterrupted cleaning. The Dirt Devil WhisperVac is perfect for swimming pools up to 16′ x 32′. The Dirt Devil WhisperVac has a powerful 2-year warranty. 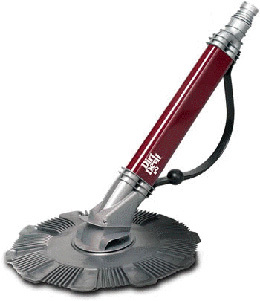 The key features of the Dirt Devil D1000 are that is an automatic Above Ground Pool Vacuum. The D1000 is a top of the line pool vacuum for above ground swimming pools. The powerful suction can pick up anything on the bottom of your swimming pool such as dirt, bugs, stick, small rocks and other debris. The D1000 offers a 100% reliability and dependability when cleaning your swimming pool. You won’t need any additional electricity; the D1000 hooks up to your existing filter system. You will never need to replace vacuum diaphragms or un-jam the vacuum wheels or replace gears that often break on the robotic swimming pool cleaners. The Dirt Devil D1000 is easy to install and includes 32 feet of pre-engineered hoses that cover most above ground swimming pools up to 24 foot round. The Dirt Devil D1000 is capable of vacuuming all styles of swimming pools from round, rectangle or oval and no matter what type of liner you have. The Dirt Devil D1000 is safe to use. The Dirt devil D1000 has a 2-year powerful warranty. 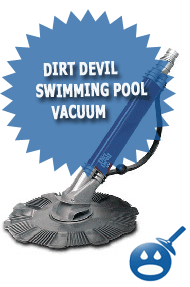 The Dirt Devil D2000 is an Above Ground swimming pool vacuum. Unlike other automatic robotic pool cleaners, the Dirt Devil does not require any additional electricity to be used; the D2000 connects right to your filter system. By the same system you can save money on your electric bills. The D2000can clean any size above ground swimming pool up to 24 round. With the Dirt Devil D2000, you will get the custom designed Unifram Cleaning Technology. This technology was designed to bring a quiet cleaning system to your backyard. The D2000 offers a quick cleaning pattern and smooth ride over the bottom of the swimming pool. There are no rollers to get stuck or fall off. The D2000 includes a ladder guard that will ensure that the D2000 will continue cleaning even if there is an obstacle in the way. The D2000 has a 2-year warranty. Dirt Devil is the leading vacuum cleaner sold for cleaning the carpets inside your home, millions of people trust Dirt Devil to clean their homes why not trust the same company with your swimming pool floors. You won’t be disappointed and with using the same filter system, you are capable of saving money on your electric bills, can it be better than that?